Update: This article has been updated with the TTC’s 2017 bus fleet plan and related comments. Update 2 December 6, 2016: The TTC’s rationale for the choice of which Hybrid Buses are to be replaced first has been added. A few weeks ago, the big TTC story was the Operating Budget and fare increase approved on November 21. However, the same agenda included the $9 billion 2017-26 Capital Budget as well as an update on proposed spending from Ottawa’s new Public Transit Infrastructure Fund (PTIF). Incorporation of additional PTIF funded projects raising their total value from $506 million in the preliminary budget to $1,160 million in the approved version. Replacement of the “City debt target” values carried forward from the 2016 budget with a “funding request” including the City’s 50% PTIF share. Reduction of the savings attributed to “Capacity to Spend” limitations. Whether the TTC’s plans fit in with the City’s financing capability and debt target will be better known once the City Budget launches on December 6, and the question of new “revenue tools” is settled. Although there is some appetite, finally, to raise new revenues in support of capital projects, the amounts likely to flow remain well below the level needed to fund all of the City’s wish list. 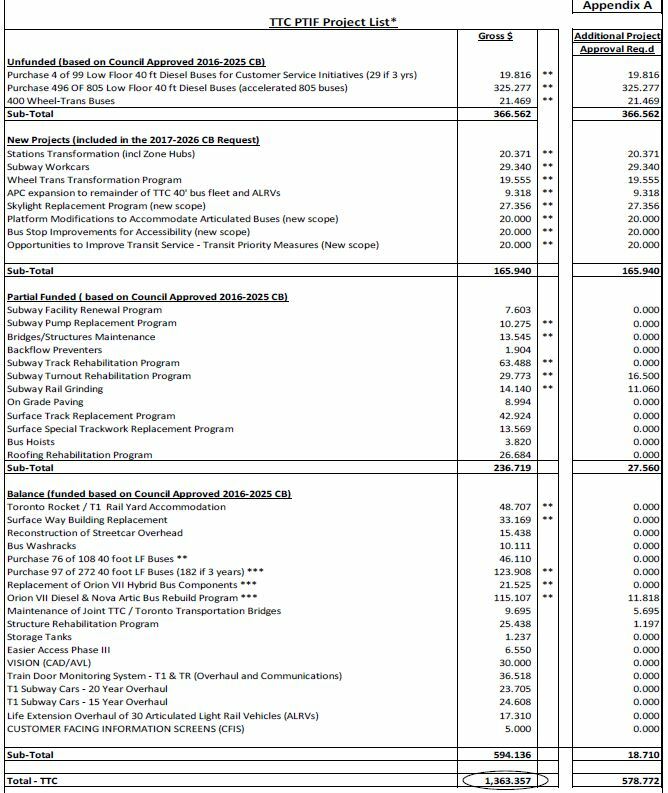 The PTIF report from September 2016 contains $720m of TTC projects (gross) with assumed PTIF funding of $360m (50%). The preliminary version of the 2017-2026 Capital Budget contains only $506m (gross) because some of the PTIF money will go toward the 2016 budget. The final version of the 2017-2026 Capital Budget contains $1.160b (gross) for funding in 2017-2019. The PTIF report from November 2016 includes $1.363b (gross) for the entire phase. 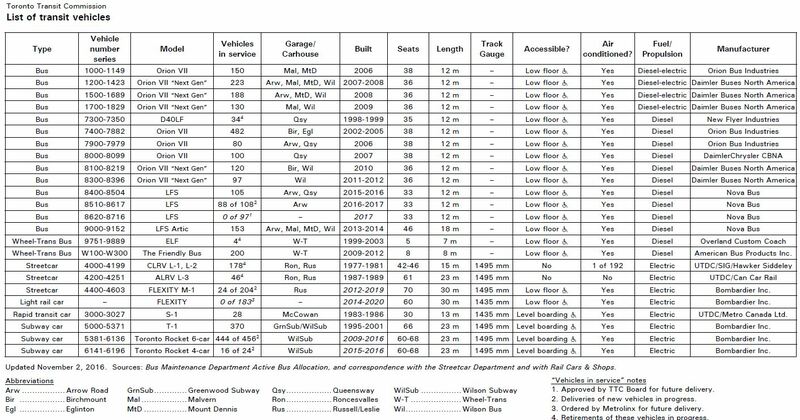 The list of TTC PTIF projects is shown below. Details for each of these are in the PTIF report. A major change in the final version of the list is the scope of the planned order for diesel buses. The previous budget approval included two orders for 108 and 272 buses respectively, of which 173 vehicles would fall within the window of PTIF funding. If PTIF phase 1 is extended to allow projects running for three years, a further 85 buses would fall within its envelope. The “unfunded” list above includes part of a proposed order for 99 “service improvement” buses, as well as over half of a planned 805 bus order that would accelerate the retirement of existing vehicles. Updated: The TTC has provided its 2017 bus fleet plan which is included below for comparison with the 2016 version. The last time a plan was published was in the 2016 budget. The service improvement buses show up as a line item here with a total of 141 vehicles, 99 of them in 2017-19. How exactly the TTC plans to operate these considering that there is no budget to speak of for more service is another mystery of TTC planning. Of course, these vehicles were ordered when Mayor Tory was still in an expansive mood about transit service. On November 30, the TTC Board approved the purchase of 285 buses to be delivered in 2017-18. This is the final exercise of an option on the Nova Bus contract under which new vehicles are now being delivered. In the plan above, the original level of procurement for 2017-18 was 221, and so this represents an increase in the 2017 plans. For PTIF eligibility, the TTC wants to bring forward bus purchases originally planned beyond the scope of PTIF phase 1 so that part of this order will receive federal funding. Originally, planned bus purchases would have been 115 in 2019 and 120 annually thereafter. Updated: Here is the 2017 plan. Note that planned purchases in 2022-26 have been reduced and shifted to 2017-19. To put the accelerated order for new buses in context, here is the TTC’s fleet list (taken from the current Scheduled Service Summary). The hybrid bus fleet has been no end of trouble for the TTC, and these vehicles date from 2006-2009. They were intended to last into the 2020s with some receiving overhauls in 2022-23 in the 2016 plan. The 2017 plan shows the retirement of some but not all of the Hybrid fleet, but makes no provision for overhauls of the remaining buses in the next decade. The majority of hybrid retirements are for the original Orion VII buses (1000-1149), and for the second batch of Orion VII “Next Gen” buses (1500-1689). A portion of third batch (1700-1829) would retire in 2019. The other major retirement triggered by the additional buses are the 482 Orion VIIs (7400-7882). Retirement of the 180 Orion VIIs (7900-7979, 8000-8099) has been moved forward to 2021-23. The TTC has clarified why the 223 Orion VIIs Next Gen Hybrids (1200-1423) have not been included in retirement plans. This set of buses is in the midst of an overhaul program and early replacement makes less sense that targeting the slightly newer vehicles that have not been overhauled. Buses to reduce passenger wait times and crowding and to provide more reliable and expanded services. This is something of an exaggeration if the vehicles are intended only as replacements, not as net additions to the fleet. Allowing for better reliability of new buses versus the existing hybrids, this will make more vehicles available and reduce the in service failure rate. However, reduced crowding and wait times, not to mention expanded services only come with better operating funding that puts more vehicles on the road. Among the new bus maintenance policies the TTC has considered would be the increase of the spare factor in the fleet to 18%. This means that for every 100 buses scheduled in peak service, there would be 18 buses in maintenance. That number does not include the “capital spares” required for warranty work and major overhauls. In the 2016 fleet plan, the scheduled requirement was for about 1,600 buses, but the total fleet was 27% higher. TTC management, in presenting their budget, stated that if the large bus order goes through, they will be able to defer a move to a higher spare ratio. 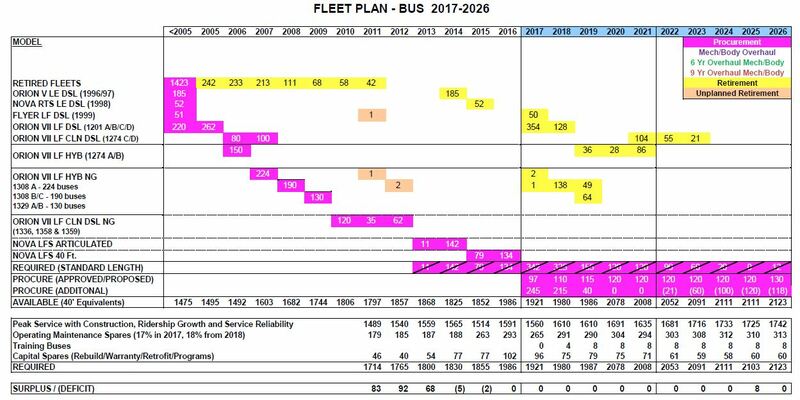 Updated: In the fleet plan shown above, the move to an 18% maintenance spare ratio remains in the plan, implemented over two years. In the short to medium term, a large order of new vehicles should increase overall reliability and availability, but there is a catch involved in this type of planning. All of the new vehicles will age at the same rate, and less than a decade out, the bus fleet will on average be “older” than is ideal driving up failure rates and lowering fleet reliability. Moreover, the fleet replacement will have a sharp peak much as TTC streetcar and subway orders now do, and this will be a strain on future budgets. Indeed, the City has repeatedly asked the TTC to flatten out its vehicle procurement cycle to reduce the effect on budget planning, but with the lure of a potload of PTIF money, the TTC and City appear to be headed in the opposite direction. 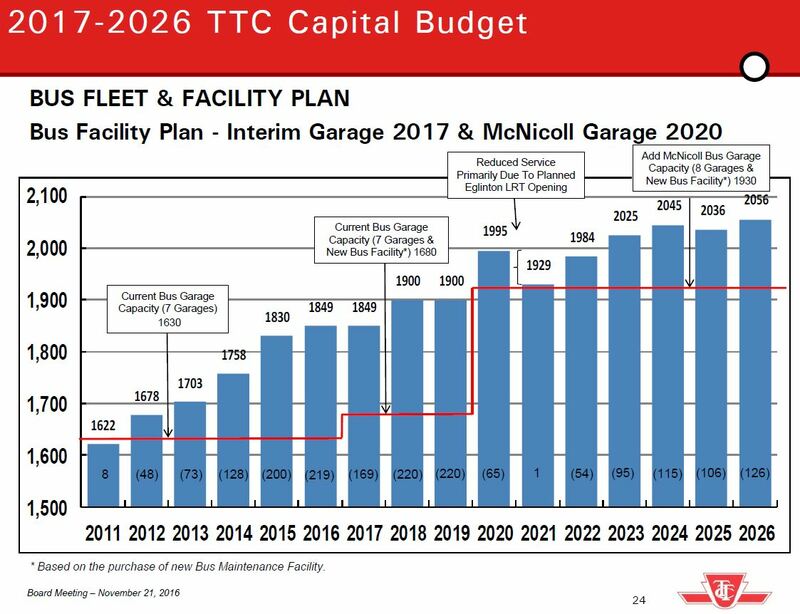 Finally, the ten-year budget contains only design funding for a new bus garage to follow after McNicoll Garage, but no money for construction. If the TTC plans to increase its fleet, even allowing for offsets from the opening of new rapid transit lines (Spadina, Eglinton, Scarborough), they need somewhere to put the vehicles. Separately from the TTC’s “state of good repair” budget, there are many large infrastructure projects of which only some are for transit. These are in the City of Toronto’s list for the second phase of PTIF funding. The costs shown below are gross values, and the federal share of this would come to $12 billion on a 50% basis. In turn, that would require that Toronto commit an equal amount to most of these unless Queen’s Park feels the urge to contribute as well. 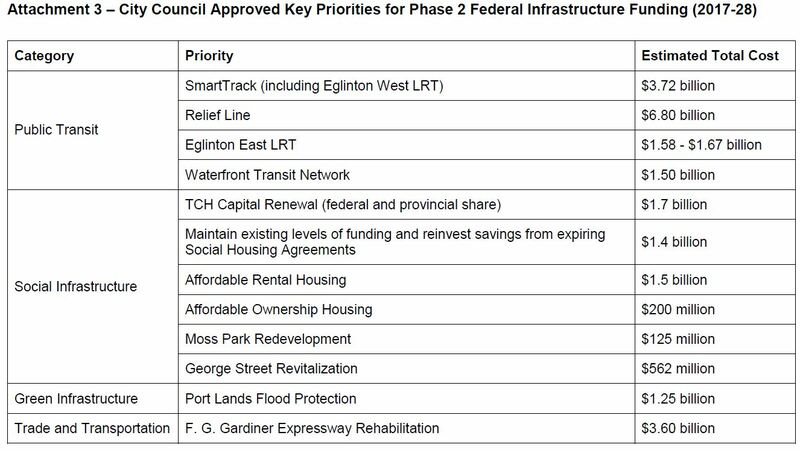 A notable change here is that the Eglinton East LRT is included as a PTIF project, not as part of the “bundle” of Scarborough projects used to make the subway extension palatable to a majority of Council. The next cost estimate for the extension is likely to be even higher than the current one. Decisions to move forward with these projects are separate from the TTC budget, but influence it because there is only so much money to go around. Moreover, some of the new projects, notably the Scarborough Subway Extension (SSE) trigger the need to move projects on the TTC’s list from unfunded to funded status. There are several projects related to the Scarborough Subway, but not included (or at least not fully) in its budget. Replacement of the existing T1 subway car fleet with 372 new cars (62 new trainsets). The existing T1 fleet cannot be economically equipped for Automatic Train Control (ATC) which will be the signalling technology on the extension, and a new fleet must be in place before this opens. 62 trainsets will be sufficient to operate the BD + SSE line with every other train running beyond Kennedy to STC, but not with full peak service. Moreover, there would be no spare trains to increase service on BD beyond its current level. The original version of the SSE budget included money for additional trains to bring the line up to full service, but whether this has been traded away to pay for increasing costs on the construction project remains to be seen. A new fleet of subway cars in the style of the TRs now on Line 1 YUS will require a maintenance facility designed for this equipment, and the system will have to deal with an overlap when the new fleet is arriving before the old one is retired. Greenwood Shops was not designed for TR-style trains operated as a single unit. The TTC is contemplating a new subway yard near Kipling Station. Work is now underway to increase system storage capacity, but this will only allow for all of the existing T1 fleet to be stored along the Bloor-Danforth line, not for additional storage for co-existence with a new fleet. The 2017-26 budget contains money for design of a new facility (p 26), but not for its construction. Conversion of the existing Line 2 Bloor Danforth subway to ATC. This work is not specific to the SSE, and it does not have to complete before the SSE opens (just as the Line 1 YUS conversion will not finish before the Spadina extension opens). This project is included in the 2017-26 Capital Budget (p 21), but the timeframe has been pushed back to end beyond 2026 when the SSE opens. Commitment to the Scarborough extension with a 2026 opening date will require that the unfunded projects associated with a new BD fleet be brought forward. This has not been mentioned in financial plans for the SSE presented at the TTC or at Council. The preliminary version of the Capital Budget included a piece of creative accounting intended to make the TTC’s funding needs look a bit less severe than they might be. In the preliminary version, the TTC assumed that close to 10% ($858m out of $9.4b) of its planned spending would not actually occur. This was based on the premise that each year’s budget is underspent, and therefore they really didn’t need the entire $9.4b. That schemes falls apart because the overwhelming reason for underspending is not that the work is not done, merely that it occurs in a later year than originally planned. In the final version of the budget, this adjustment is still present, but it has been reduced to $482m over 10 years, notably by excluding it from all of the PTIF projects. It really would not do to ask Ottawa for billions, only to turn around and say “we’re not really going to spend it all”. Moreover, treating deferred spending as if it were a permanent cost reduction creates a situation where the city understates its future capital needs. This may look good in the short term, but it catches up with us in the long term. By such devices are “cost overruns” created. With the arrival of PTIF and other adjustments, there is considerable difference between the budgets presented in September and in late November. These changes are summarized in the attached table. My apologies for its size, but the two originals on which this is based are themselves densely packed with numbers. The chart is organized with three pages on which the years from 2017-26 run across the pages, and the sources of funding run down. The change for each item is shown to highlight what has shifted between the two budgets. Note that some rows and columns do not add up due to rounding in the source documents from the TTC. Also note that this chart is for the “base” capital budget and does not include special projects such as the TYSSE or SSE for which funding comes from other governments, nor does it include any of the Metrolinx projects. There is no change in anticipated provincial funding and this remains at a fixed level from the gas tax over the decade. Queen’s Park gives more to Toronto than is shown here, but the remainder is used as an Operating subsidy. Similarly, the federal gas tax is assumed to remain unchanged over the decade. The PTIF funding extends only to 2019 because this is Phase 1 money. Phase 2 projects will show up separately as and when they proceed just as the TYSSE is split out now. CSIF (Canada Strategic Infrastructure Fund) has now run dry and is replaced by PTIF. It had some funding in past years, but not for 2017 and beyond. The treatment of the City’s contribution has changed from the preliminary to the final version. In the preliminary version, the full headroom from the 2016 debt target was included even though the TTC did not actually require all of this funding. That treatment produced a “surplus” in years where TTC spending would have been lower than the City’s headroom. In the final version, only the actual requirement for City funding is included. In 2017-18, the amounts expected from the City’s “Asset Monetization” have been replaced by the more generic “Capital Financing Strategy”. With the decision not to sell Toronto Hydro or the Toronto Parking Authority, funds available from “monetization” are lower than before. They have been offset by PTIF. There remains a $275m shortfall in 2017 as I described early in this article. This is related to the proposed order for 60 more Flexitys whose future is uncertain. Whether this order will be placed, or placed in 2017 (and hence a matter for this year’s budget) remains to be seen. Over the ten year plan, there is little change in proposed total spending, and not much increase in funding (note that about 40% of PTIF Phase 1 money was already included in the preliminary budget). Most PTIF money will go to new projects, and after the burst of support for state of good repair over the next few years, the City will be back to wrestling with shortfalls in available capital funding. This buys time for a few budget cycles, but does not address the structural problem in funding for the base budget.